Unfortunately, traditional property law is based on a woefully obsolete worldview and antiquated economic premises about human beings and social and ecological realities. It sees all of these expansions of property law as a form of wealth creation – when in fact it often amounts to wealth destruction (monetizing nature), redistribution from the have-nots to the haves, or a transformation of the intrinsic use-value of something into exchange-value (price). It presumes that value is only created by individuals trucking and bartering in the marketplace, and the Invisible Hand does its magic. Property law does not generally acknowledge the actual value generated by social collaborations, by complex natural systems and by inherited knowledge and culture. It is blind to non-economic relationships such as gift economies, informal relationships, social communities and care work. You could say that property law generally simply does not recognize the commons and its significant role in generating value. What exactly do I mean by the commons? Well, the term has been so poisoned by conservative ideologues and economists over the pasts two generations that the first idea that leaps to mind when you mention the word “commons” is the tragedy of the commons. Let me quickly dispense with this annoying distraction. The tragedy parable, as I call it, was launched by biologist Garrett Hardin in his famous article in the journal Sciencein 1968. Hardin said: Imagine a pasture that can be used by anyone, and in which no individual farmer has a rational incentive to hold back his use of it. Hardin declared without any empirical evidence that every individual farmer will of course put as many sheep on the pasture as possible. This will inevitably result in the over-exploitation and destruction of the pasture and produce a tragedy of the commons. The “tragedy parable” is regarded as such an economic truism that it has become a cultural cliché – an idea drummed into the heads of every undergraduate. Champions of “free markets” have invoke the tragedy meme to celebrate private property rights and so-called free markets -- and to fight government regulation and any collectivist alternatives. The only problem is, Hardin was not describing a commons. He was describing an open-access regime that has no rules, boundaries or indeed no community. This is not a commons. It is a free-for-all. A commons is a social system for managing resources that has a bounded community, specific rules for accessing the resource, mechanisms to monitor that usage and punish free riders, and so on. In fact, the situation Hardin was describing – in which free riders can appropriate or damage resources as they wish -- is more accurately a description of unfettered markets. You might say Hardin was describing the tragedy of the market. The late Professor Elinor Ostrom of Indiana University powerfully rebutted the whole tragedy of the commons fable in her landmark 1990 book, Governing the Commons: The Evolution of Institutions for Collective Action. Her fieldwork and creative theorizing shows that it is entirely possible for communities tomanage natural resources as commons without over-exploiting them. So the commons can actually work and work well. How can that be possible? Contrary to the Hardin parable and its many prisoner’s dilemma offshoots, people in real life tend to actually talk to each other. They negotiate rules to protect community interests. They build systems to identify and punish free riders. They cultivate powerful cultural values and norms. And so on. The commons is in fact a flourishing system of self-provisioning around the world, mostly operating outside of the market and state. Here’s an amazing fact: An estimated two billion people depend on various natural resource commons for their everyday survival– farmland, fisheries, forests, irrigation water, wild game. This role of the commons is largely ignored by economists, however, because the self-provisioning of the commons takes place outside of conventional markets and is therefore considered without value. No money is changing hands; there is no boost of GDP. How could anything worthwhile be taking place within these commons? Professor Ostrom -- an Indiana University political scientist who spend her career studying the dynamics of effective cooperation in managing resources – won the Nobel Prize in Economics for her work in 2009. She was the first woman to win the award. I don’t think this was incidental. Unlike her (male) economist colleagues who treat property as an inventory of objects to be shuffled around, Ostrom opened up the discussion by exploring the rich potential of social relationships and collaboration in meeting needs. But here’s where the story starts to get interesting. In recent years, independent of the Ostrom-inspired academic scholars, a burgeoning international movement of commoners have arisen to build their own commons – and to challenge attempted enclosures of their shared wealth. This eclectic, sprawling movement goes way beyond the small natural resource commons in the global South that Ostrom studied. This movement consists of food activists trying to rebuild local agriculture through such means as permaculture, community-support agriculture, Slow Food and cooperatives. It includes techies writing free and open source software programs that are now standard elements of most commercial software. It includes universities and scientists and academic disciplines that are committed to sharing their research and data on open digital platforms, often with Creative Commons licenses. The commons can be seen among seed-sharing farmers in India who wish to avoid GMO crops and practice a kind of open-source agriculture. You see the commons in the explosion of open design and manufacturing – which is product design that is globally shared but locally manufactured and inexpensive, modular and accessible to anyone, in the style of open source software. This movement has produced the Wikispeed car that gets 100 miles per gallon of fuel….the Farm Hack community that has produced dozens of pieces of affordable farm equipment…. and the scores of hackerspaces and Fablabs of the Maker movement. The commons can be seen in new projects to build “shareable cities” in which urban residents play significant roles in managing parks and water systems, kindergartens and urban planning. The commons is at work in cities that host participatory budgeting processes that let ordinary people deliberate about budgets. It’s also at work in alternative currencies, such as the Bangla-Pesa in Kenya, which has made it possible for poor people in slum neighborhoods to exchange value with each other. What unites these highly diverse communities? They are all asserting a different universe of value. They all share a basic commitment to production for use, not market exchange. They are asserting the right of communities to participate in making the rules that govern themselves. They want fairness and transparency in governance. And as commoners, they are asserting a responsibility to act as long-term stewards of resources. The commons also consists of a certain ethic – a commitment to protect everything that we inherit or create together, so that it can be passed on, undiminished, to future generations. Far from a “tragedy, the commons should be understood as a vibrant social and political system for managing shared wealth. It is a system of self-governance that emphasizes inclusion, fairness and sustainability. It empowers ordinary people while avoiding crippling dependencies on the market or state. We know how the market, by contrast – at least in its globally integrated, highly concentrated and socially disconnected and amoral forms – tends to transform customers into dependent vassals. Now, historically, most commons have not needed nor sought formal protections of law. Their self-organized customs and relative isolation from outside capital and markets, were enough to sustain them. This has changed dramatically over the past thirty or forty years, however, as global commerce technology and conventional property law have expanded relentlessly, superimposing the logic and values of markets on nearly every corner of nature and social life. Our common wealth is vulnerable because typically the state has no formal, clear property rights protecting them. Indeed, the state has little interest in granting or clarifying collective property interests because it would prefer to collude with investors and corporations to privatize this collective wealth. As usual, invoking the tragedy parable, the state presumes that only the private appropriation and monetization of common wealth can produce prosperity and human progress. Expansive private property rights are crucial instruments in advancing this process. And inequality, Pikketty and others have documented, is an inevitable result. 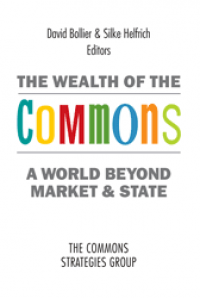 I wish to suggest, therefore, that – apart from some of the redistributionist strategies mentioned yesterday – the commons is a vital tool for assuring a more equitable predistibution of wealth for all. By that, the commons provides the most durable, structurally effective way to ensure that people’s basic needs are met – and this in turn will foster greater political equality. Citizens must have legally guaranteed access to and use of the resources that they require for their survival, dignity and cultural identity. If we truly wish to address inequality, then we must find ways to reclaim the commons and reinvent the Law of the Commons. (Re)inventing the Law of the Commons may sound way ambitious, but consider this: People in the thirteenth century arguably had stronger legal rights to subsistence and survival than people do today. Thanks to Magna Carta and its companion document, the Charter of the Forest, people had guaranteed legal access to the forest to gather firewood, water for drinking and planting, acorns for their pigs, the right to hunt wild game and collect fruit, and much else. Commoners had legal access to the means of production and subsistence – which is more than contemporary markets and many states are willing to guarantee today. If you ain’t got the do re mi, as Woody Guthrie put it, you’re out of luck. · Users of Linuxdon’t have to pay tribute to Microsoft, but can control their own software infrastructure and escape the proprietary tax of forced upgrades. · Locavoresdon’t have to suffer the costs and risks of GMO foods and industrialized, processed food. · People who live in housing owned by community land trusts can avoid the high rents and speculative prices of the open housing market. · Students and scholars who use open textbooks and open access scholarly journalscan avoid the exorbitant prices of commercial journals, expensive website paywalls and the surrender of copyright control. · Users of cooperative finance and alternative currenciescan mutualize their shared wealth and avoid the predatory practices of commercial banks and privately created fiat money. · City dwellers who rely upon municipally owned utilities or commons-based water systemscan escape the costly dependency on investor-owned utility monopolies, and develop more ecological alternatives. The basic conclusion that I am making here is this: The commons provides assured structural access to vital resources and services, outside of the market and state. And in so doing, commons help assure greater equality in societies. 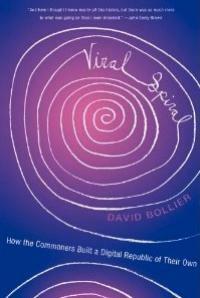 Commons help people reduce their costs, fortify their economic independence, and strengthen their political sovereignty. To be sure, participating in a commons also entails certain responsibilities and initiative – both personal and social – to protect shared wealth. 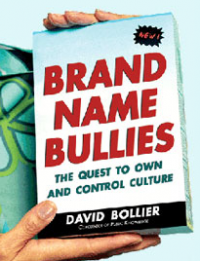 But this, too, is a good thing – because it is an emancipation from the whole scheme of producer/consumer relationships that tend to alienate people from each other, promote consumerism and inflict nasty “market externalities” on to the environment. As stewards of shared wealth, commoners tend to manage resources with a more holistic, long-term and collective perspective. 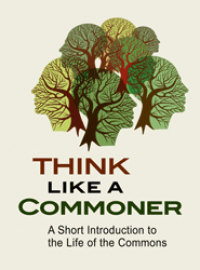 Commons offer a credible escape from the pathologies of the unsustainable growth economy. But here is a key question: What role should property law play in all of this? If the commons is a richly generative system for meeting people’s needs, then surely property law ought to take account of this fact. Unfortunately, as I mentioned earlier, traditional property law simply does not recognize the actual value of commons. I am happy to report, however, that there is a massive amount of legal innovation already underway to protect the commons, using property rights and other forms of law. Our ambitious challenge, I would argue, is to invent a new amalgamated field of inquiry that I call the Law of the Commons. This is a complicated challenge, mostly because the modern liberal polity and conventional law are philosophically hostile to the commons. A system of law focused on individual rights, private property and economic growth, is not especially receptive to the paradigm of the commons. Most commons-based legal innovations that I’ve encountered amount to hacks – i.e., they are ingenious subterfuges and creative workarounds to the standard forms of state law. This is exactly what Richard Stallman and the free software movement did in inventing the General Public License, of GPL, which provided a critical legal foundation for the evolution of free and open source software. It’s what Larry Lessig and his colleagues did in inventing the Creative Commons licenses, another copyright-based license that turns copyright law inside out to make creative works automatically shareable rather than automatically private property. Let me quickly review some of the more significant forms of commons-based law that commoners are putting forward these days. In the global South, in order to subsistence commons, some indigenous peoples have been rallying around a legal instrument known as “biocultural protocols,” which the South African group Natural Justice developed. The protocols are seen as a way to protect indigenous peoples from the market enclosures that would otherwise be sanctioned by international trade treaties, by declaring agro-ecological and cultural practices off-limits to markets and trade. Stakeholder trusts are a new frontier of legal innovation, especially in the US. These are state-chartered trusts to collect, manage and distribute revenues from natural resources such as oil, water, minerals and forests. The great precedent for this is the Alaska Permanent Fund, which generates about US$1,000 a year for every resident of Alaska – a rare source of non-wage income for ordinary people. Commons scholar Peter Barnes has expanded this idea to apply to many other common assets, in his book, Liberty and Dividends for All in an attempt to deal concretely, and with direct cash payments, to address in inequality. New sorts of legal frameworks for digital commons are a robust field of innovation as well. There is now an attempt to move beyond copyright based licenses on open platforms, such as the GPL and Creative Commons licenses, to enable digital communities to retain for themselves the surplus value that they create. Michel Bauwens of the P2P Foundation has proposed commons-based reciprocity licenses – of what he calls CopyFair – to ensure that digital communities can reap any monetization of their content from commercial users, while allowing non-commercial users to continue to use the work for free. In a similar fashion, there are now efforts afoot to develop seed-sharing licenses so that farmers can protect their seeds from third parties who might appropriate and patent them. The blockchain ledger, as pioneered by Bitcoin, may be one of the most revolutionary innovations in the Law of the Commons. This technology is significant because it allows digital identity authentication and secure transfers of assets without third-party guarantors like banks or governments. Although Bitcoin has used the blockchain ledger for standard libertarian, capitalist purposes, especially speculation, the technology can be used to facilitate social cooperation in radically new ways – in effect, moving law from the oral and written to digital media. One important offshoot that many “computational lawyers” are working on is smart contracts, algorithm-based technologies that would new sorts of network-based contracts that could be negotiated on the fly, online, without the standard written contracts and lethargic court system. This, too, is an important realm of new types of commons-based law. Co-operative law is another form of commons-based law that is reviving many little-used historical models while developing new types of governance. For example, there are many multistakeholder co-operatives in Italy and Quebec that go beyond worker and consumer co-op models, to empower third-parties to participate in such things as eldercare and social services. The Sustainable Economies Law Center in Oakland, California, is exploring new forms of co-operative governance to empower members. Old forms like community land trusts and “garden cities” – in which the city owns the water systems, land and other infrastructure, which it mutualizes for everyone’s benefit – are experiencing a revival. Along the same lines, a San Francisco-based group called Shareable has developed a series of papers outlining “Shareable Cities” policies, which are aimed at helping city governments work with residents to develop “sharing projects” ranging from car-sharing to tool-sharing to neighborhood services. A number of cities such as Linz, Austria, are pioneering open digital platforms for urban renewal by making all sorts of information available online for free. I have not yet mentioned the many new legal initiatives attempting to strengthen local self-determination, mostly through community ordinances and so-called community charters. There are also new organizational forms such as “omni-commons,” which provide administrative, fiscal and legal assistance to help incubate small enterprises with a commons orientation. At an even larger level, there are many legal initiatives underway attempting to re-imagine governance according to commons principles. 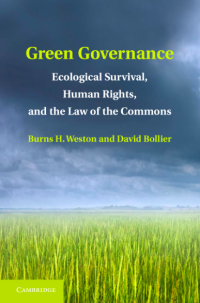 Some of these look to the public trust doctrine in environmental law to uphold the interests of commoners, as in a series of lawsuits seeking to force governments to deal with climate change. Others, such as a project by some Italian jurists, are trying to establish a human right of people to access and use common assets, protecting them from market enclosure. Just a few months ago, French legal scholars held a conference on European juridicial strategies for the commons. We are seeing a remarkable burst of creativity to find new structures of law – in contract law, trusts, co-operative law, municipal government, copyright and patents, organizational charters, and more – to protect the social practices of commoning and the values it stands for. What is this all about, ultimately? It’s about honoring the sovereignty of people to devise their own forms of governance to meet their needs and local context. It’s about the importance of bottom-up initiatives and participation, and of transparency and accountability. It’s about meeting people’s needs without relying on the dysfunctional formalities of bureaucracy, the market/state duopoly of power, or the social inequities associated with markets. Given the explosion of legal creativity in creating, maintaining and protecting commons, old and new, I have high hopes that this new field of legal inquiry, the Law of the Commons, will help move us beyond the limits of conventional law, governance and bureaucracy. 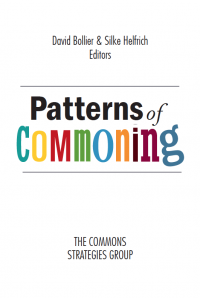 At bottom, the Law of the Commons is about nurturing the social norms, policy structures and institutional practices that can help human beings flourish. There is a great deal of research, creative theorizing and activist experimentation that must proceed, but I believe that commoning, as enabled by a reinvented Law of the Commons, will help address some of the most urgent ecological, social and political problems of our time.